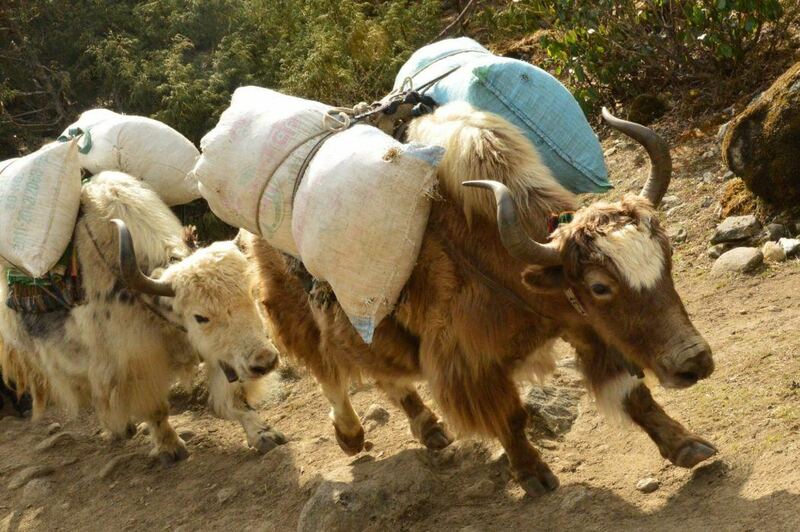 I did a lot of research about trekking in Nepal before I went on the EBC trek. 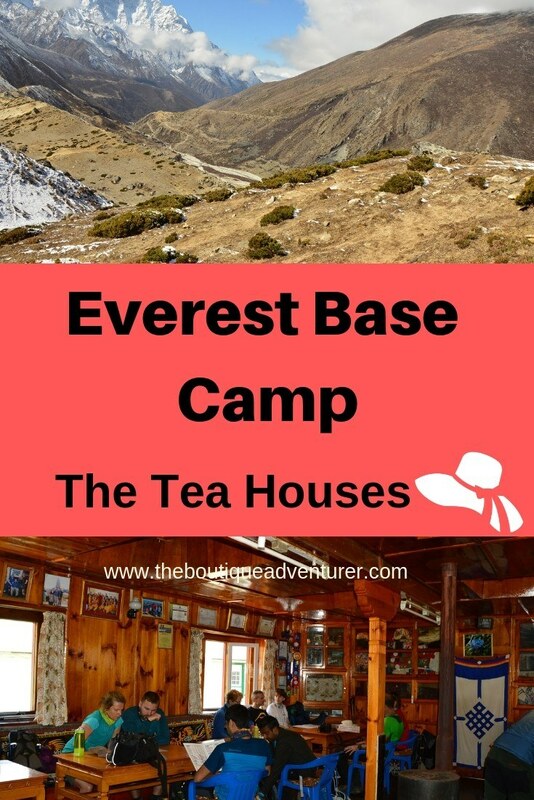 There was quite a bit of general information but I really struggled to find much about what an actual Nepal tea house was like, would I be able to charge my phone, Everest Base Camp Trek food and most importantly what could I expect when it came to showers! So when I went I took lots of notes and photos to help you manage your expectations! Ah, where to begin! 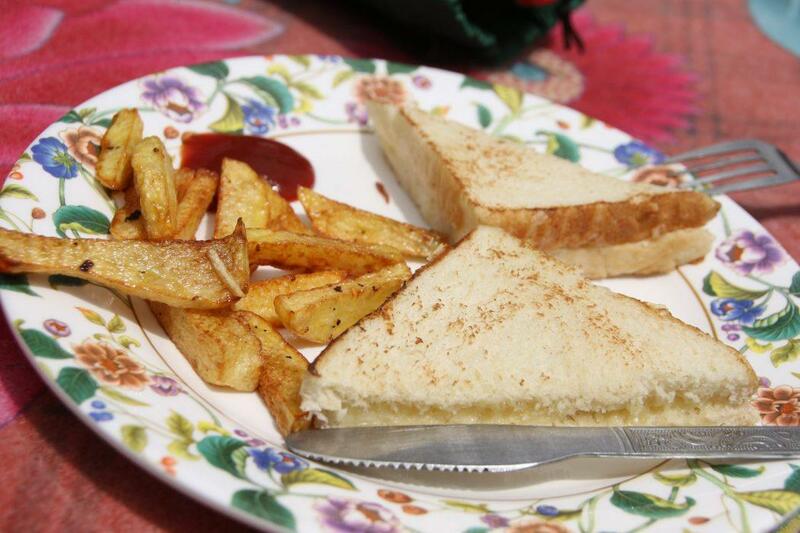 Yes, you get told that a Nepal tea house is basic. And Basic they are. The thing is it gets harder to put up with basic night after night. 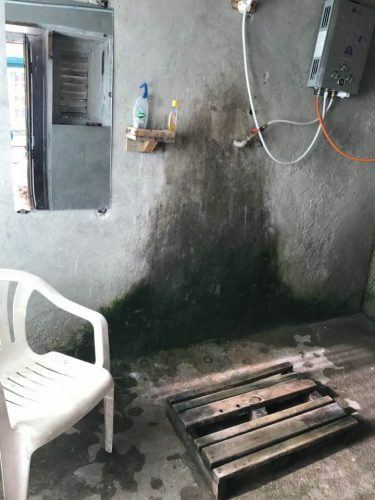 The reality is basic isn’t so much the problem – the problems are normally how unbelievably cold it is and the state of the toilets. And tea house sounds kind of cute doesn’t it? Like somewhere basic but atmospheric, I’m thinking candles and cushions etc. I was very wrong! Anyway, I am jumping ahead. 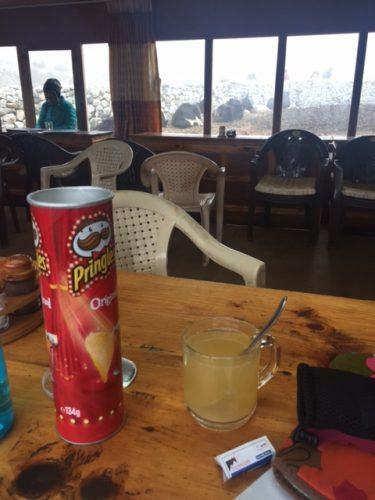 So the quality of the Everest base camp tea houses varies. The general rule is the Everest base camp trek tea houses lower down are better. This is for several reasons. Firstly I think there are more of them so there is more competition so they have to try harder. Secondly, of course, it is easier to get things and to run a better operation at a lower altitude. I would have thought that you could still keep things clean at any altitude but apparently, this is easier at lower altitudes as well! The tea house rooms are very same same – the only difference is the size. Which does make a difference. The higher up you get the harder it is to swing a cat in them. You need to put your big bags under the bed and be quite clever with your day pack. Usually, will have to get ready one at a time with your roommate as you can’t both get ready at the same time without major overlap and discomfort. However, every bed did feel clean. They have a fitted sheet, a pillow and a pillowcase and a duvet type thing. I brought my own pillowcase which I was pleased about and also had my sleeping bag. The first couple of nights I didn’t use my sleeping bag too much but I certainly needed it after that. If you are going to buy a sleeping bag and think you’ll get some use of it I would recommend buying a double one. Yes you will lose some heat but I found a single one so restrictive – it would wake me up every time I needed to turn over which was often! The best bathroom set up – an ensuite!!! The bottom tea houses Everest base camp trek were quite good in terms of having showers which had decent hot water and felt clean. The key is to have a shower as soon as you arrive in the afternoon. There are limits to the supply of hot water and it is first in best dressed or undressed. Also first in will have the cleanest shower as the cleaning happens after everyone leaves in the morning. This also goes for the toilets which get worse as the evening goes on. Don’t forget to bring shower gel and shampoo with you as this isn’t supplied. You will also need your own towel. A couple of the lower down tea houses would rent towels but I didn’t see what the quality was like on these. This is another benefit of having a shower as soon as you arrive – you can then take your towel into the warm room and put it on a chair near the stove to dry it. The standard of the tea houses hike begins to drop around 4000m. It is recommended that you don’t shower 4000m and above. I believe this is for a couple of reasons. Firstly you could easily catch a chill and secondly, I assume the water quality is not great and it would be easy to swallow some. To be honest it is that cold in the tea house trekking nepal that once you are that height you won’t want to take off your clothes! The cold is really challenging. There is always one central room where you eat that is kept warm. But gosh it is tough when you have to go to bed and be outside that room. As soon as we got in for the day I would then have a “wipes shower” and put on my evening outfit. Keeping your head warm during the night is a challenge and a soft hat is a lifesaver. The worst part is that once you are at this altitude you will most likely be getting up quite a bit in the night to use the loo as your body urinates more often at altitude. This is not fun when it is so incredibly cold. It is also not fun when that loo is very dirty and the wastebaskets are overflowing. The last couple of everest tea houses before base camp and the one we stayed at the night we did base camp were by far the worst. The smell, the cold, the lack of hygiene – it really was time to grit your teeth and just get through it. 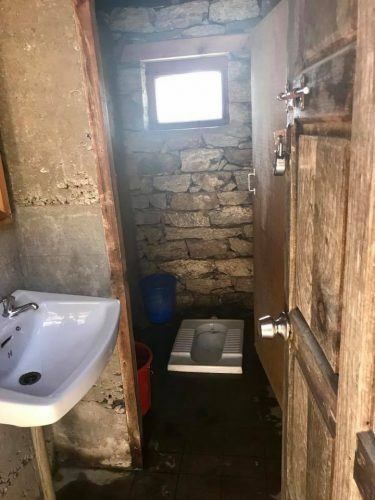 Also, you end up with about 2 toilets max for about 40 people – most of whom are also suffering to various extents from altitude. 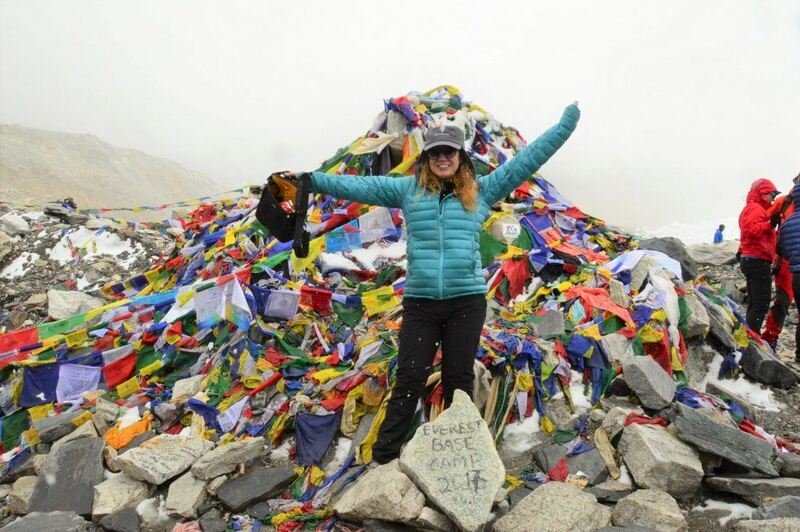 I only speak the dirty truth in this Everest Base Camp blog! The communal warm areas are normally quite good and quite clean. Again the only issue was at a very high altitude where the communal areas are packed. 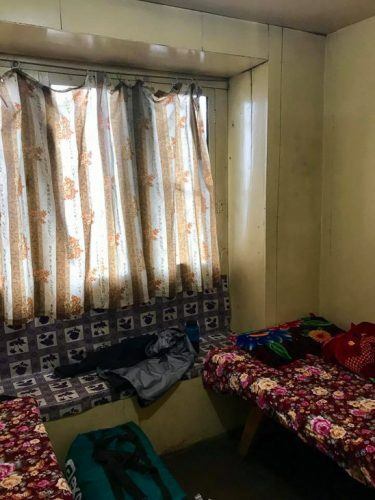 Our tour company had reserved areas for us which were great but we all had to squeeze in and it made them less pleasant for sitting and relaxing – not great when your only other option is your freezing cold room! Every Everest Base Camp trek Nepal tea house apart from one had some type of basin where you could brush your teeth. They did have water but usually, I used the left over from my “hot water bottle”/metal flask. 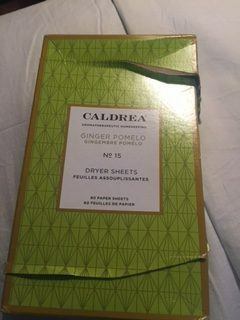 Please note with all of the above I am someone who is over 35 and used to a much higher thread count on my sheets so I am a harsh judge of this type of accommodation. To be honest it was all bearable apart from the dreadful hygiene standards in the toilets at the highest level. You will definitely need to have your hand gel close by at all times during those stays!!! And I recommend having some time at the lovely Dwarika’s Kathmandu as a reward when you get back to Kathmandu! 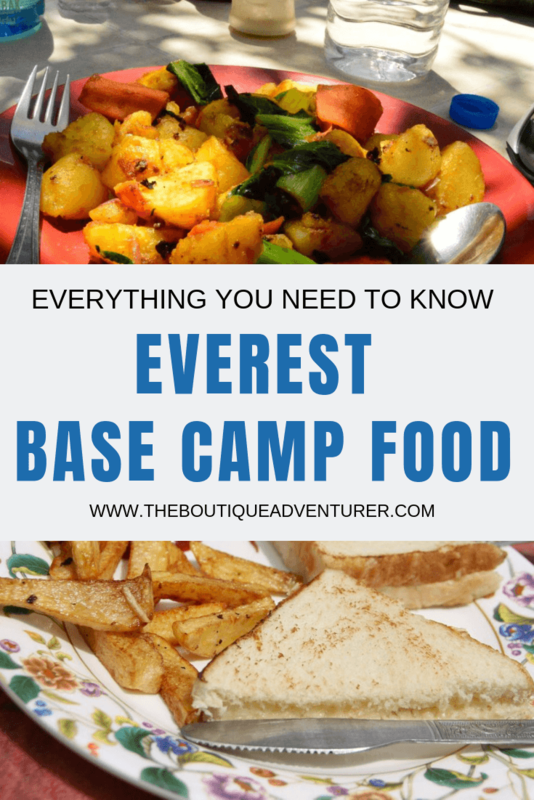 Let’s start with the good news – the Everest base camp trek food was a lot better than I expected! Even once we were quite high – albeit by then your appetite is pretty shot due to altitude. Even the biggest hungriest guys in our group barely ate at this point. 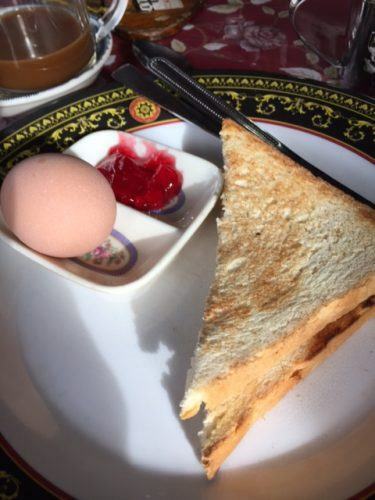 There is, of course, quite a bit of variation in quality of the food on Everest base camp trek as you stay in different tea houses throughout the trek. Breakfast tends to be included in the tea house cost and then you stop at a “restaurant” – normally another tea house – for lunch and then usually have dinner at your tea house. Breakfast is ordered the night before and tends to start with a choice of porridge or muesli and warm milk. 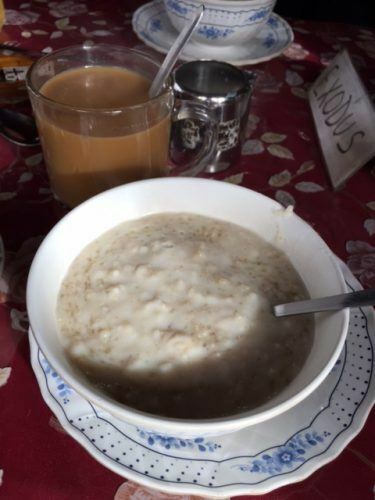 The porridge is generally tastier – and easier to make tastier as all tea houses on the Everest Base Camp Trek have sugar and honey. The quality was mixed but the majority were pretty good. You then get toast -generally a very manufactured type of white bread but there is normally a good selection of spreads. Eggs are next up – in a few places this is in pancake form which was pretty good – American style. You can get fried but my favourite was to get boiled. I found the oil often didn’t agree with me and a boiled egg was a safe friend and source of protein! And then there are the warm beverages. 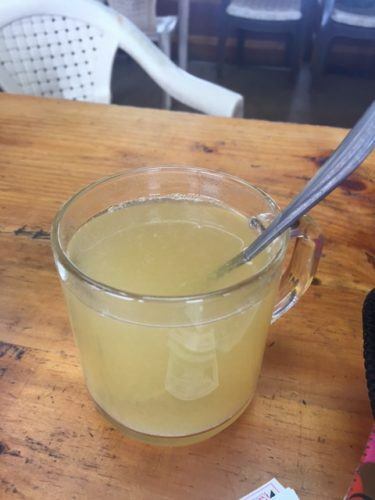 Honey, ginger and lemon will become a very good friend of yours. It is very comforting and also great for the dry throat you get as you head further and further up the Trek. There is of course tea. And then the coffee was very mixed. 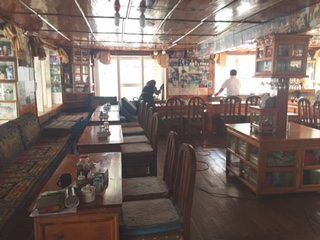 A couple of places had freshly ground coffee which was excellent – Tengboche was a highlight and is the Everest tea and coffee house! 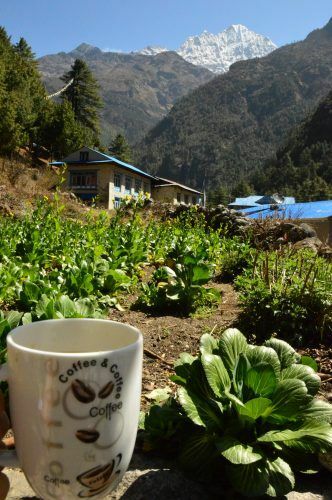 In Namche Bazaar there are several takeaway Everest coffee places! In general, if you order coffee with milk you get their bodgy coffee and a whitener. The better option is to take a small can of your own (I took Lavazza instant), order boiling water and ask for hot milk. You can get hot milk all the way up. This was definitely the best coffee option. 2. 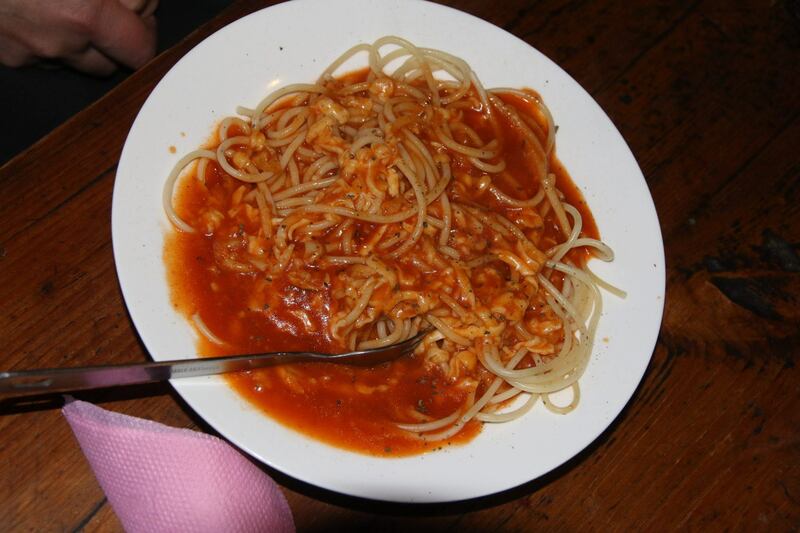 Pasta – I didn’t order any of this as I was concerned about the spiciness of the tomato sauce and they filled them with cheese. They did tend to look ok.
3. 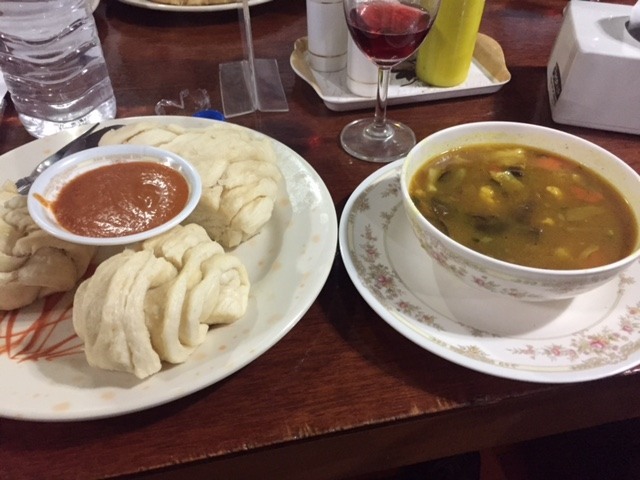 Sherpa Stew – this was my favourite. Vegetarian. Everyone’s was a bit different so you got some variety which was nice. I found no matter what I could usually eat at least some of it. 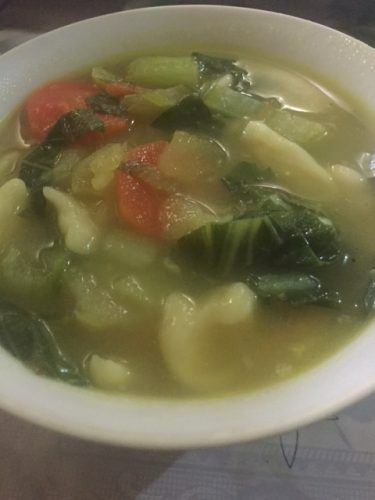 It is essentially stock/broth and vegetables. 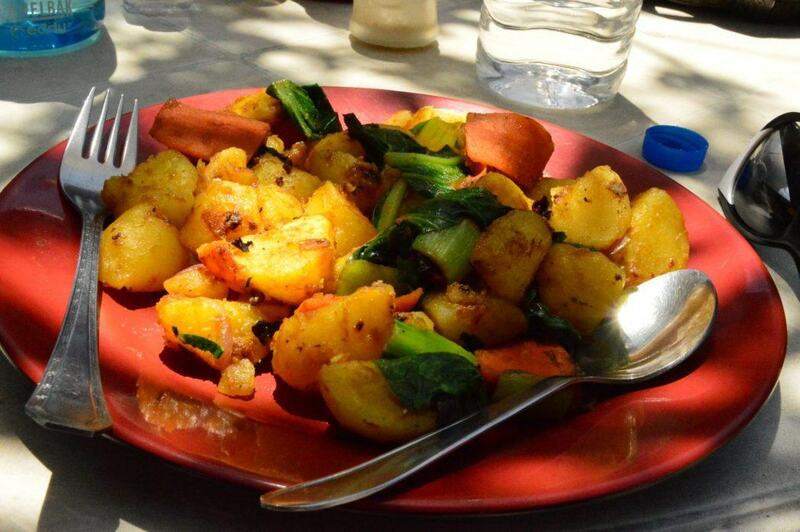 And when they say vegetables don’t expect them to be anything green – it’s all about carrots and potatoes. Potatoes are everywhere. 5. Dal Bhat – the classic dish. Again like the Sherpa stew everyone does something different so it is good for variety. Vegetarian again. I tended to have this for lunch. I liked that it was lighter on my stomach vs having anything with potatoes or pasta in it. 6. Potatoes – are everywhere!!! 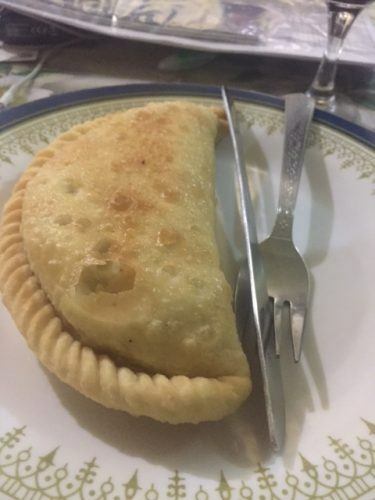 You can just get a plate of them with cheese on top. Or some ketchup on the side. Or some vegetables on top. Or fries are everywhere and they are not bad – more like your mum made vs mcdonalds. I did find I wasn’t that keen on the oil they were pan-fried in and I did find they were too heavy for lunch but each to their own. There was a lot of apple pie. To be honest I had read quite a bit about these lovely bakeries and the fantastic apple pie. Well, I have to say I didn’t see any of that. There were no cute bakeries and everything like that I tried was pretty blah. The first apple pie we tried was like an apple sandwich. Then there was some ok pastry but way too much filling. Our guide warned us not to eat baked goods over 4000m as they had often been made quite some time ago but the cold dry weather allowed them to look fresher than they were. You can buy chocolates, pringles (they are everywhere vs other types of crisps) pretty much the whole way – with the price going up as you do. There are also issues with the use by dates on some of them. I bought mostly my own from the UK – loads of Twirls and wine gums. A lot of my chocolate melted and then reformed but to be honest it tasted fine! And then I bought another stash in Namche so I had stuff with me every day. I found each day I needed a roll of wine gums/fruit pastilles (I normally gave away half) and one chocolate bar. 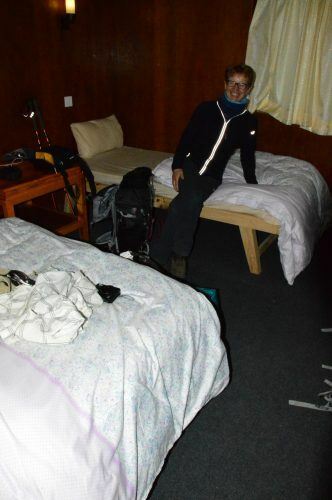 This didn’t change much at high altitude as my appetite was broken – by base camp I couldn’t even eat chocolate. I probably ended up with more than I needed. You can also normally get soft drinks the whole way up. A sprite can be a sensation when you can’t eat much and are constantly thirsty. You can, of course, get water easily but you have to steripen/tablet it to make it safe. I just bought water the whole way. Your guide will normally give you a sense of how much water you need to carry for each leg – there were very few times you needed to carry more than 2 litres with you as you would be able to fill up again. I had a water bladder which I found best to use as it was easiest when trekking and thus helped keep me hydrated. I also had my metal bottle which I put in the side pocket upside down to avoid full freezing. This bottle was most helpful at night when I got it filled with boiling water and wrapped my towel around it and used it as a hot water bottle! I would then use the water from it to clean my teeth in the morning. The 2 best tea houses for food and coffee were the one in Namche and the one in Tengboche. Funnily enough, they are owned by a husband and wife – he runs Namche and she runs Tengboche! Apparently spending the season apart every year is the key to their happy marriage! 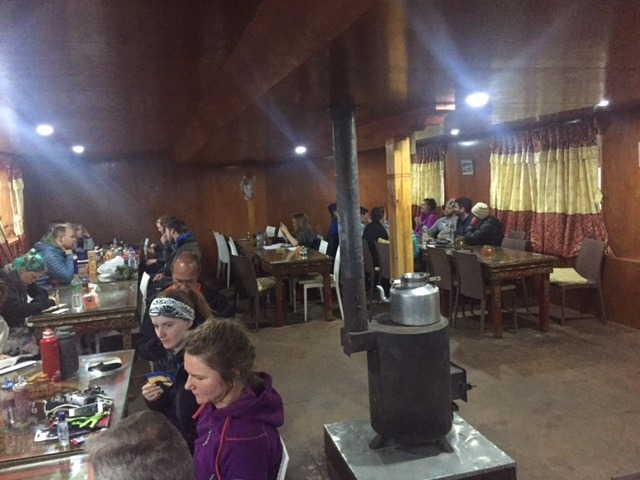 By the end, you will never want to see any of the base camp Trek food ever again but I imagine this would be the same with any type of cuisine that was all you could eat for 12 days! Or try my favourite Middle Eastern Airlines – particularly if you like flying Business Class! I flew with Qatar Airways business class when I went – read my Review of Qatar Airways Business Class here. This is one trip where you MUST take out travel insurance! I certainly ended up using mine! Click here for a quote on travel insurance. For a really good comparison of tour options available check out Viator. I travelled with Exodus. Exodus is the biggest tour operator for Everest Base Camp so there are quite a few benefits in going with them in terms of expertise, access to the best teahouses etc. They also know what they are doing and are very organised. As Exodus is a big deal in Nepal anyone working with them locally will be keen for this to continue and therefore service levels are pretty good. 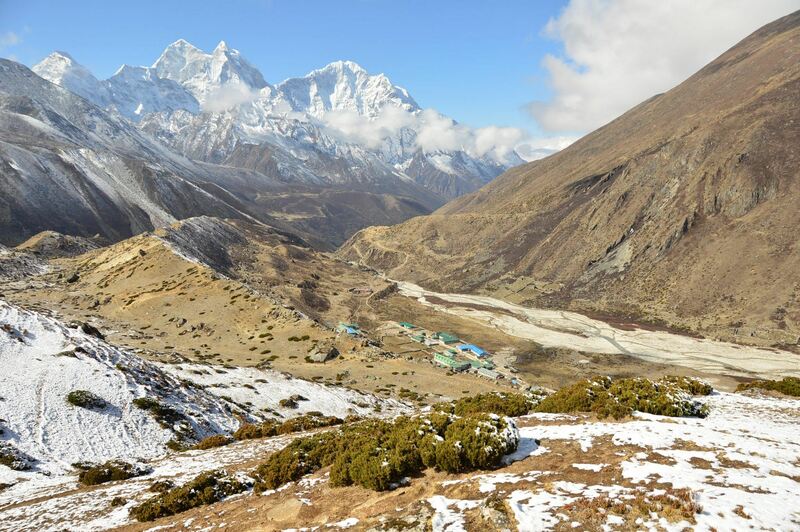 Click here for Exodus Everest Base Camp Treks. In terms of UK based tour operators, we saw quite a few G Adventures groups during our trek. They tend to stay at the same kinds of tea houses and have a similar setup. I have also heard that Intrepid are a good operator for base camp. So I read a lot of mixed things about the facilities before leaving for the trek. It did sound like there were options for showers, charging etc but it was hard to get a handle on how much to expect. So here is my blow by blow description! One of the first things that happen when you get to a new tea house on an organised tour is that you will be sat down, order and served a warm beverage and then briefed. Part of this briefing is almost always what facilities are available and the costs and procedures to access them. The first consideration when it comes to facilities is keeping all your devices going! Every place I stayed was able to charge items every night. There were a couple of quick eg one minute blackouts but that was about it. The cost of charging increases as you head further up. It started at about 200 NPR and got up to 450 NPR at Gorak Shep. There was a mixed approach to what charging actually got you. In some places, this got you one power point and one device charged. In other places charging was more for power packs vs say phones and camera batteries. Then in other places, they were very relaxed and you grabbed what power points you could. Having said that I never once had the problem of not being able to access a power point and I travelled at peak time – late April. I also took an extension cord with me that also had USB points (2 plug capacity). I did only use this once and it was quite heavy so probably not needed. My key piece of advice would be to take a fully charged power pack (I took the Anker) with you in addition to all your other items. You can charge multiple devices of this at once. Also as you get higher up the mountain your devices – particularly your phone – may lose charge during the night due to the cold. My next piece of advice is put your phone and power pack in your sleeping bag with you – I “slept” with these every night. Ah, where to begin! One of the most important facilities for me was the shower options. 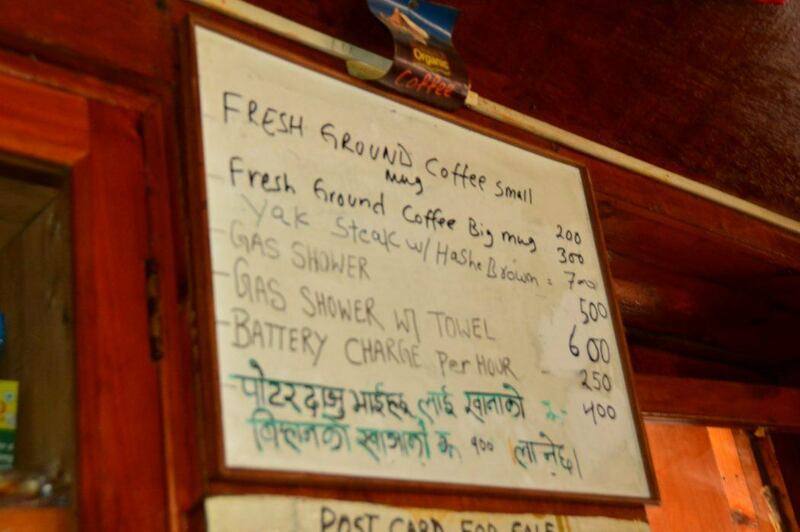 So virtually every place I stayed at under 4500m had a hot shower option. A couple low down had showers in the room but they only had cold water so make sure you check that! I think only one place had 2 showers – most were just the one. 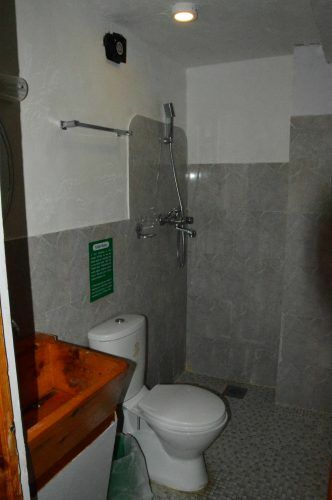 The key was to have your shower as soon as possible after arriving. The hot water supply ran low and there were often queues – and queues that meant you might miss out. It also meant you used the shower at its cleanest point – relative yes but still important compared to using them at the end and there being a lot of stray hair ugh! One of the single most important things you can pack is flip flops. These are critical in the shower. Firstly you don’t want to touch anything. Secondly, it is generally very cold so you don’t want your feet directly on the “floor”. The showers are VERY basic! 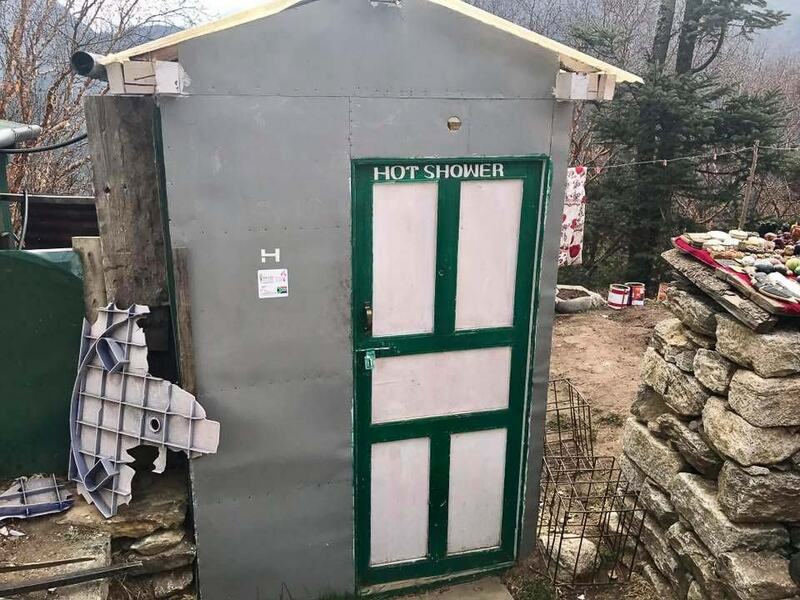 Literally a shack usually with a showerhead. The water did get quite warm though to be fair. There is only enough water pressure about the first 1-3 nights to wash your hair. Also to be frank it is too cold in the shower to want to wash it any higher up. Make sure you take shower gel etc as there is none of it there. And an absorbent towel. Again good to be first as you can then take your towel into the communal area and put it on a chair near the fire to get it warm. We were very excited to discover a hair dryer in Namche! And it was pretty effective! You actually could take a hair dryer with you. Quite a few rooms had power points or you could use it in the communal area. But again you would only want to wash your hair in the first couple or last couple of days so it probably isn’t worth the weight. Showers were always charged for – anywhere between 450 and 600. It is generally not advised to use the showers over 4000m. There are several reasons for this. One is that the water is poorer quality and you risk swallowing it. Secondly is it is hard to get dry without getting a chill. The third reason is the quality of the tea houses drops rapidly at this level as does the quality of the shower and quite frankly wipes in your room looks like a much cleaner option! Also by this point, you are always cold so you don’t feel quite as dirty. I recommend enjoying some luxury pre and post the Nepal Tea Houses! Without question the best boutique hotel in Kathmandu is the lovely lovely Dwarika’s – Read my review of Dwarika’s Here. It isn’t exactly boutique but as options at a higher boutique end are a bit low in Kathmandu I am going to list the Hyatt Regency Kathmandu. Kathmandu has some more basic boutique hotels that offer great value for money. 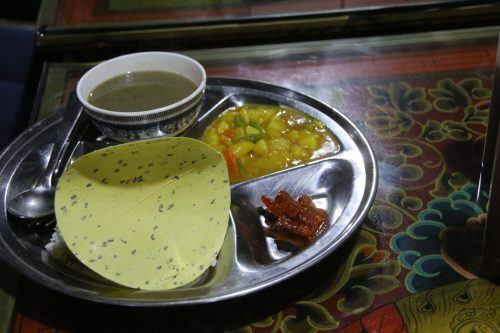 Dalai-La and Kantipur Temple House offer traditional Nepalese style. Aria Boutique Hotel & Spa is somewhat more modern with its offer. Uniquely for Kathmandu, its interiors are heavy on white! Click here for Latest Prices and Availability for Dwarika’s Kathmandu. Aria Boutique Hotel & Spa latest prices and availability. After my trek, I went heavy on luxury and stayed at the stunning sister hotel to Dwarika’s Kathmandu – Read my review of Dwarika’s Dhulikhel here. A key question is what about wifi on the Trek? 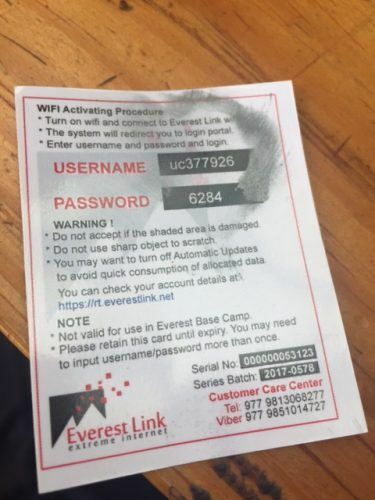 So we had wifi all the way up to Everest base camp. HOWEVER it was to varying degrees. The first 2 nights were actually the worst quality wifi – kept dropping in and out and you could barely open anything. Things got a lot better from night 3 once the wonderful Everest Link kicked in. 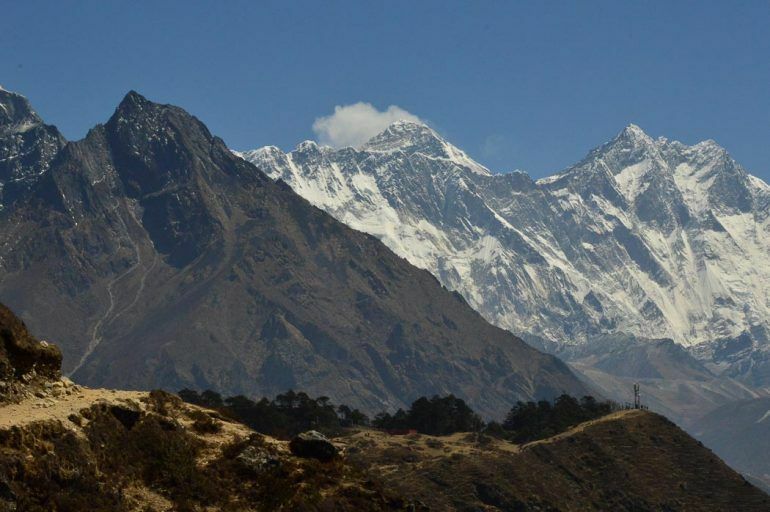 Everest Link is the network that goes all the way up to base camp. You can buy a card which gets you about one hour’s use. The wifi is very powerful. However, it does get full. Again you are best to get on it as soon as you arrive at the tea house and check email. Once lots of people have arrived and it is early evening it, of course, gets a lot slower. And then I found it was very strong in the mornings. You usually bought 200MBs – sometimes I seemed to run through these very quickly, sometimes I would have extra bandwidth in the morning. It was a bit pot luck. Ask the tea house owner to rub off the cover to reveal the code- they are odd cards and I nearly destroyed a couple and couldn’t see the codes when I tried! 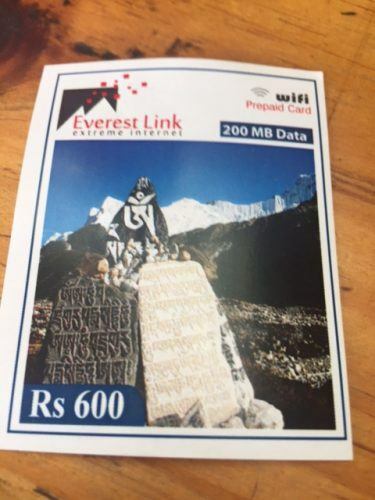 Wifi starts at about 450 NPR and goes up to about 600 for the essentially about one hour Everest link cards. A final critical element of EBC trek facilities is, of course, the ability to get wine! Believe it or not, you can buy wine the first 4 nights! And it was ok! They moved to red only for nights 3 and 4 and hey it was cold but it was ok. After that, it is not recommended due to altitude and dehydration – and you stop feeling like it. You can buy beer pretty much the whole way up but the same thing applies. It gets pretty gross on the trek. The first few days are fine – there are showers, you feel ok, you’re fresh and new. And then you hit 4000m. The quality of the tea houses drops markedly – particularly their cleanliness. Altitude kicks in and you start feeling lousy. And it gets COLD! Really cold. And very cold where you’re sleeping. And you start to not care. But hey you’re going to have these photos for life! And no one wants to smell!!! These are the realities of Himalaya trekking! So here are my learnings on how to stay clean! Not a mirror in sight at the tea houses! Get your hair colour done just before you go – you don’t want roots in the photos. There are very few mirrors along the way so that’s ok but photos last forever. Remove all body hair, get a pedicure (you’ll have few and quick showers so your colour will stay perfect) and cut your nails very short – they get damaged and broken and you don’t need more pain so have them short. 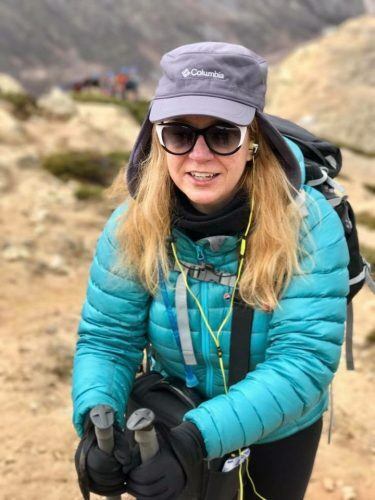 I had eyelash extensions before I left and that was brilliant – especially for those over 4000m mornings when I woke up to eyes like an alien’s they were so swollen from altitude -at least I had lashes coming through! I mostly wore mine down as it kept my neck warm, prevented sunburn and I thought looked better in the photos. However, I only got to wash it twice which was in the first few days (twice more than I thought I would!). I did bring dry shampoo but I never used it – I found my hair was far less greasy up there. One thing I did do is put it into a plait. I had that advice from my hairdresser. A plait is good because it stops your hair getting into knots. Even better put a bit of oil in it and then plait it – that will help even more (once you can wash it remember to take your hair dry and put the shampoo in and lather and THEN go under the water – oil and water and all that). Hats are very important for pictures. I started the trip with a cap. I then had a super soft fleece cap that I wore for a couple of days and it became my nighttime hat as it was the most comfortable to sleep in. I then had my heavy duty super warm cap with the flaps for the highest couple of days. Think about the colours and what you’ll be wearing them with (eg fleece or cotton top the first few days, down jacket the last few) and colour coordinate accordingly. And your hat will hide a million hair sins so wear it often! Sunglasses are also critical – firstly as you use them all the time and secondly as they will hide those puffy eyes in pics! Again look to coordinate with your jacket and caps – I took 2 pairs with me and they were Prada not sports brands. So you definitely want wipes as they are your best friend once it gets cold (and if you run low on toilet paper). Wipes and deodorants can do a lot – as can a spritz of perfume. Clean teeth are always worth doing night and morning no matter what – I was outside on a frozen terrace covered in snow at 5100m one morning with my now lukewarm water bottle water brushing my teeth on my sickest morning – and it was still worth it. I also had a facial spritzer that I got given on the plane which was a nice freshener in the morning and pre-moisturizer on the Everest Base Camp Trek. I layered my kit bag with nice smelling dryer sheets. I even inserted them into my dirty clothes bag. Also when I had tops and socks that I was going to have to wear twice I folded them up interspersed with dryer sheets – at least then they didn’t have an awful smell! My lips got SO dry! I had a chapstick type nivea thing with sunscreen in it – but it wasn’t enough. I hadn’t bought a tin of Vaseline as I was trying to avoid things that used my fingers but I needed it – and it took more than a week of continuous application of Vaseline to sort my lips out after I got back. Do not forget sunscreen and literally every day! I had mornings where my sunscreen was nearly frozen and I had to warm it up to put it on. The sun up there is harsh and you are closer to it than normal and it is almost impossible not to get some kind of colour. Shots taken from a distance are your friend! So even with all of the above, I did not get any photos on the trek that I would use on an internet dating site! However, I do have photos that don’t make me cringe and without question having ways to feel a bit cleaner were mentally very helpful. If you click through on the links in this post I am likely to receive a commission on any purchases that you make. Just wanted to make sure that you knew. 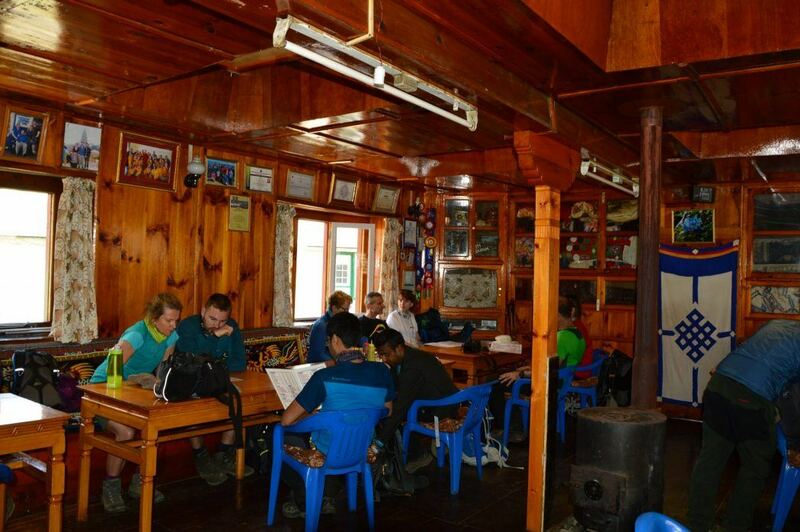 Planning on doing the EBC trek and wondering what it is really like in a Nepal Tea House? 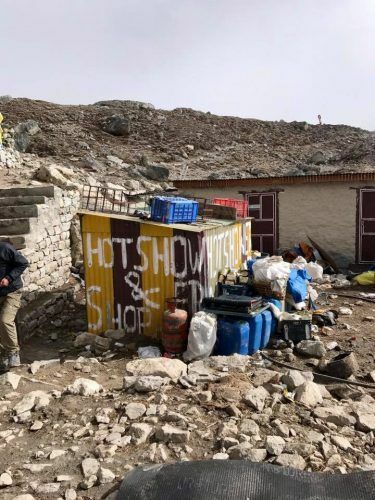 I couldn't find the info on wifi, showers, food etc before I went so I made lots of notes - here is my Everest Base Camp Blog with all you need to know about tea houses! Amazing tips! I will definitely try to bear these tips in mind! Thanks Roth. Hope you enjoy your time in Nepal! thanks for sharing this stunning post, really useful tips.